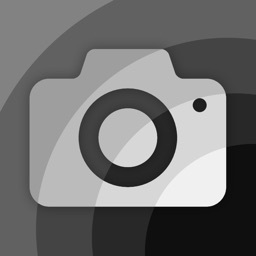 Photography Toolkit is an all-in-one app for DLSR photographers to help you when using dark ND filters, finding the hyperfocal distance and sunset & sunrise time. 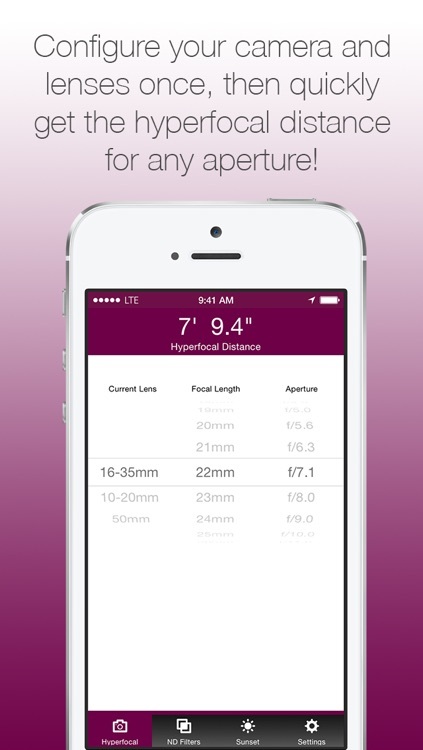 * Hyperfocal distance: Helps you determine ideal focusing distance to get as much of the scene in focus. 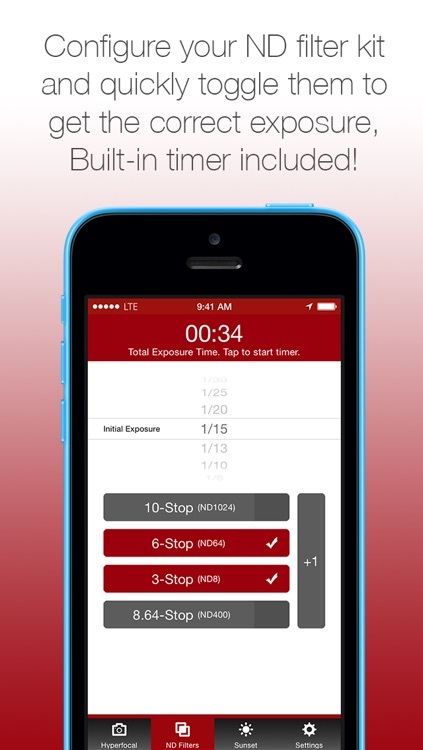 * ND Filters: Helps you determine exposure time when using very dark Neutral Density filters. 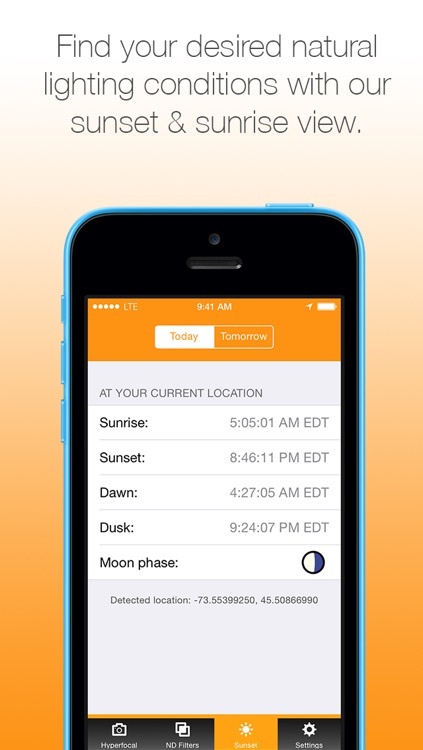 * Sunset: Helps you determine when the sunset, dawn, dusk and sunrise will occur, wherever you are. 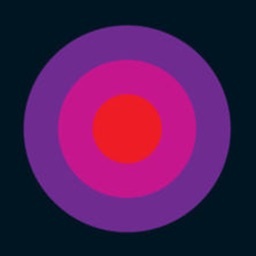 When shooting a scene, it's helpful to know the hyperfocal distance - the closest distance at which a lens can be focused while keeping distant objects reasonably sharp. 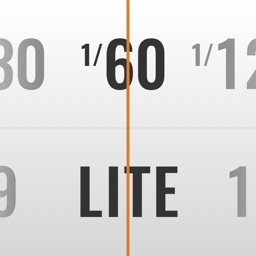 After adding your camera and your lenses to the app, Photography Toolkit will quickly calculate this distance. Using very dark neutral density filters inhibits the camera from automatically calculating the correct exposure time. Photography Toolkit solves this problem. Once you have taken a few seconds to configure your kit of filters, simply select the shutter speed, and toggle your filters ON or OFF. 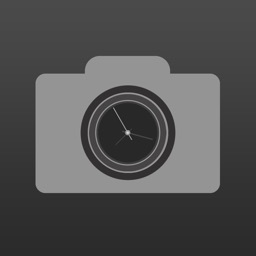 There's also a built-in timer to alert you when your photo is ready. 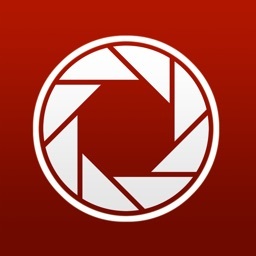 Ideal for pro, semi-pro photographers or enthusiasts. 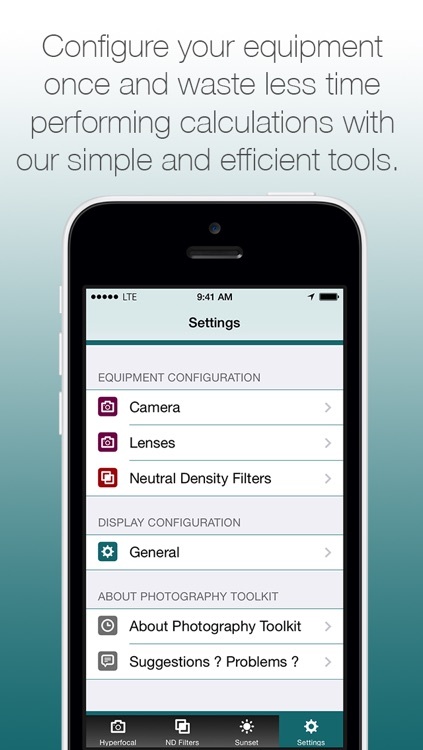 Photography Toolkit was built from the ground up for the latest version of iOS. Suggestions, questions or problems? We're here to help and we'd love to hear from you! Please contact us at [email protected] for assistance. Remember that we cannot answer support questions in iTunes reviews. > Start a timer and you can even quit the app. We'll remind you when your photo is done. * Very fast to use. Concentrate on your photography. 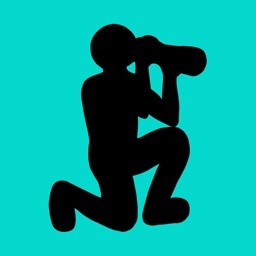 * Use your iPhone's GPS to geotag your photos with our upcoming 'Trip' module. Photography Toolkit will track your movements and save them to a GPX file.